Deborah Layton joined the Peoples Temple in Northern California when she was 18 years old, and eventually became a trusted aid to Jim Jones, the group’s charismatic leader. 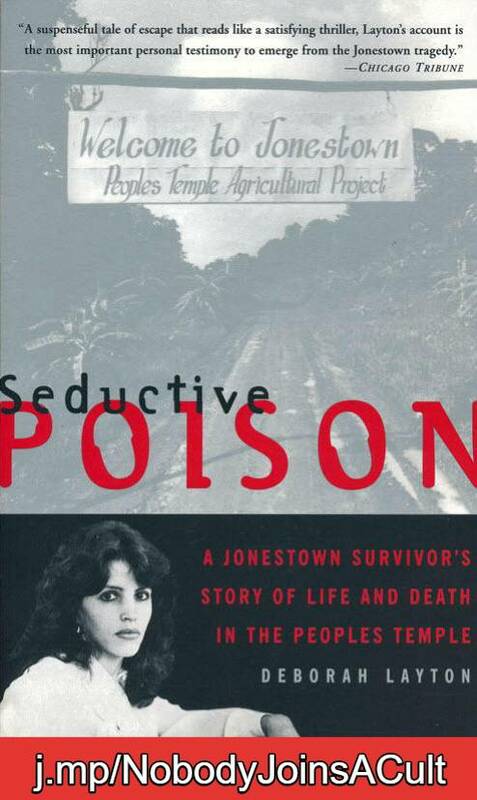 In her memoir, Seductive Poison: A Jonestown Survivor’s Story of Life and Death in the People’s Temple, she describes how she fell for the answers Jones seemed to offer, and eventually found herself involved in the upper levels of his organization. Faced with increasing media scrutiny based upon allegations by former members, Jones in 1977 moved his followers — including Deborah — to Guyana. Jones promised them a tropical paradise, free from the supposed wickedness of the outside world. But when she arrived, Layton saw that something was seriously wrong. The settlement of the ‘Peoples Temple Agricultural Project’ — informally known as Jonestown — was surrounded by armed guards. Food was scarce and members were forced to work long hours and follow rigid codes of behavior. She also noticed that Jones became increasingly delusional and dictatorial. By May 1978, Deborah Layton was ready to make her escape. Four weeks later she submitted a 37-point affidavit about the compound in Guyana, which helped convince United States Congressman Leo Ryan to make his journey there to investigate claims that people were being held there against their will. Six months later tragedy struck. A total of 918 people, including 276 children, died in the organized mass murder/suicide — the greatest single loss of American civilian life in a deliberate act until the events of September 11, 2001. It was a tragedy Layton had predicted with eerie accuracy. Seductive Poison, reads like a thriller, but it is a true story — presented with scrupulous honesty and thoughtfulness. It is generally considered the most important personal testimony to emerge from the Jonestown tragedy. This mesmerizing, well-written story shows how people from any background — regardless of race, culture, class, or education — can fall prey to the seductive poison of cult leaders and their cults. It is a must-read for parents and friends of loved-ones who are involved in cults and other high-demand groups, as it will provide a wealth of understanding. At Apologetics Index we have heard from people who happened to read the book while still involved in such groups — two of them while they were in an abusive relationship (sometimes referred to as ‘one-on-one cults’). They testified how Layton’s story opened their eyes to their own situations. Some ex-members may find that sections of the book work as triggers — bringing to light issues that must still be dealt with. In that case, see Coping with Triggers and Floating, by Carol Giambalvo. Cult Definition – What is a cult?